Home » OUTDOOR » 25 Picturesque Garden Path and Walkway Ideas Adding New Heights to The Beauty of Your Home! Blending in with the natural scenery and the florals in the smoothest ways, garden paths are a chic integration to the yard or the garden. Apart from glorifying the appearance of your home, they lead to the front door of your house, or simply offer a passage to walk outdoors without disturbing or damaging the plants. Get inspired by these 25 amazing garden path and walkway ideas and build one for your yard in a budget-friendly deal. 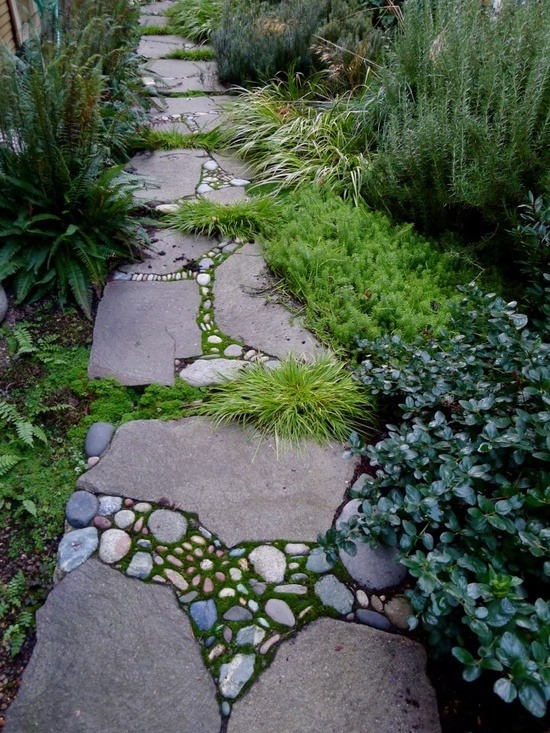 The idea here is to create a beautiful garden path from imperfect and irregular stones and pebbles. So, a pleasing, well structured and graceful stone mosaic garden walkway is the way to go. This garden path is so easy to construct that you can do it all by yourself by simply arranging a few items together without even calling for any high-end tools. We bet this is going to enhance the whole look of your garden or backyard almost effortlessly. You can always add some color to pop it up or to match the entire theme of your existing garden. All you need is to lay flat stones through the pathway and fill the uneven gap between them with pebbles. This amazing wooden step path not only improves an existing walkway but also adds a large dab of class to it. To get started, all you need to do is to lace up a regular basic gravel pathway with a few wooden planks. It will bring an urban yet minimalist look to the space with a tint of rustic while maintaining the level of your path at the same time. This bright idea works even with an even ground, letting you choose gravel of different color and stain the wooden planks to match the existing decor of your garden. Go with some well structured, geometric shapes or a bunch of irregular one – it’s totally a matter of choice. The whole idea is to uplift your garden game and take it to the next level. The inspiration aims at creating a beautiful artwork consisting of small pebbles and stones in order to form an elegant spiral shape that can replace your previous garden path just right. The whole process require a lot of your time but the end results will be worth it all. You will require a few wooden planks, some nails, hammer, rubber mallet, stiff bristled brush and a spade. You can always go with pebbles and stones of your choice, also knowing that color is no bar as long as it suits the overall theme of the garden. Difficulty level on this pathway is a little high but the final product will surely steal some looks from everyone who pays you a visit. You can go with the pattern of your choice or use the one in the image. As magnificent as it seems, this graveled pathway is equally easy to construct. The aim here is to achieve that simple magnificent look while maintaining the graceful overall theme. All you need is gravel laid out through the path which is surrounded by beautiful colorful plants and flowers. A walk through this masterpiece is bound to make you feel like you are walking through a fairy land. Even better is the fact that it requires the least of your time to get it all done. Go for white gravel for an urban appeal or choose just about any hue to mix up with your existing theme. This minimalist pathway will make you feel relaxed even in the most tiring days. A wooden panel pathway not only looks simple and clutter free but also raises the class quotient drastically. It is as easy to create with just a handful of supplies as it looks – all you require is some wooden lumber, a few nails and some basic tools that you probably already have in your lawn or garden. The subtle look of the wooden pathway also adds that minimalistic urban feel to the space instantly. You can also stain the wooden panels with a nice tint or simply keep it unaltered to flaunt the natural texture of wood. Be it a walk in the garden or guests coming through the front door, this wooden panel pathway is destined to grab all the sneaking gazes. The best thing about this wonderful idea is that it can be put together on both – even or uneven lands. Be it your garden, the front yard or the backyard, this amazing pathway made out of flagstones and pebbles is going to look no less than mesmerizing. As easy as it looks, this masterpiece is worked up with the most basic of tools, flagstones and river pebbles. Just laying required flagstones throughout the path and filling the gaps between the individual flagstones with small pebbles is going to do the trick. This wonderful pathway is going to add the much needed spark to your garden and become the talk among the neighbors. There are many patterns you can easily think of or simply forge the one flaunted by the following Pin. What you are going to love most about this pathway is the completely natural feel and texture it comes with. Apt and appropriate for gardens with large plants, this one goes for a minimal expense and super easy to follow steps of construction. You start by placing the paving stones one after another throughout the path and cover the space between them with mulch in order to keep the stones in place. Another benefit of using mulch for the filler is that it will allow soil to soak almost all of the water and keep the garden healthy. You can also spread the excess mulch in the spaces between the plants for a seamless looking garden. The best thing is that as messy as you go with the final appearance of the path, it’s going to look more and more stunning. Perhaps, the easiest walkway to work around, this one calls for nothing more than some lace, paving stones and some spray paint to get started. Just put lace over the paving stone and spray on the top of it with white paint, getting the whole pattern on the lace imprinted onto the surface of the stone. Make sure you go for a spray paint that complements the garden and its decor. Remove the lace after the paint gets dried and repeat the process on the remaining ones. After you are done, place the lace patterned paving stones as shown in the image one after other to construct the whole path. This walkway not only looks like a artwork but also gives a an age-old vintage touch to the garden. You can go for variety of patterns to come out even more extraordinary. Find the detailed instructions in the link provided below. The pallet garden walkway is a great way to recycle reclaimed pallets or used wooden crates. This not only looks oh so earthy and rustic, but is also environmental friendly. All you need is some equal-sized wooden pallets that you further place in the soil in a snuggly manner so they won’t move. Coat the wood with a nice stain for some extra finish or allow the natural imperfections to flaunt. This beautiful walkway is going to turn heads with covetousness. You can go completely DIY on this project and it only takes nothing more than a couple of hours of your time. For detailed instructions on how to start making one, follow the link below. The most amazing thing about this pathway is that it requires almost no tools at all. All you need to do is to level the ground and place cobble stones into the same in some beautiful patterns. Get as vivid with the colors as you can and make the whole yard pop out with vibrance. After you place the cobblestones, fill the entire space between the larger ones with smaller rocks. Even shapes have got a whole possibility for variety as the colors with this inspiration. With all the different designs and color, your neighbors will surely envy the style and class that you just integrated into your garden. The levels of grace donned by this walkway are really overwhelming. All you need is lots and lots of stone slates and just a few hours of work. You can start off by outlining a path running through your garden, further removing all the grass and stones that lie within the outlined pathway. After leveling the ground, lay along the stone slate, while making sure that you leave a little space between the slates which is later filled with soil. It adds that countryside look to your existing setup and looks so natural at the same time. For the detailed instructions, visit the link below. Not only this pathway looks elegant but is equally clever to work up. All you need to do is to lay rectangular paving stones in a stepped pattern on a leveled ground just like shown in the image in order to make sure that they stay put where you lay them. The class this pathway will implement to your front yard or garden is absolutely immense. This is easy, requires no tools to achieve and is budget friendly. You can also fill the surrounding exposed soil with the mulching material which will not only add to the amazingly rustic look but also help the soil to retain more water. 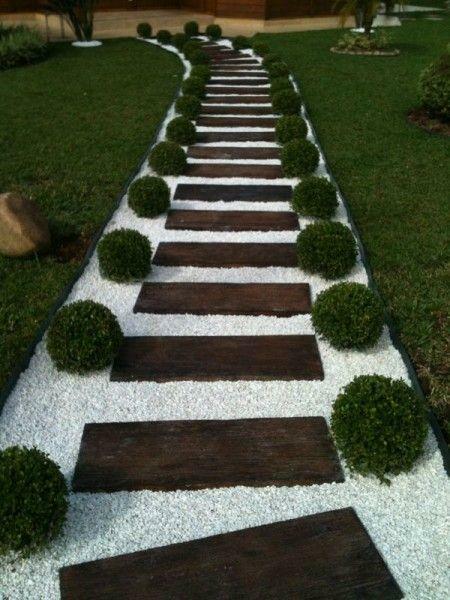 This walkway is more of a garden decoration that transforms even the simplest of backyards into a complete fairyland. It requires just a handful of tools and is just so easy to pull off. All you need is loads of irregular shaped flagstones and a couple of hours. Start by laying flagstones unevenly on the leveled land one after the other until you cover the desired path. Filling gap between the stones with small rocks and mulch will contribute to that forest rich look instantly. Finally, plant some indigo tinted plants and flowers on both the sides of the walkway, and voila. You can play along the color to match it with your existing garden hues.